The year is 1995. Place: Las Vegas. Event - Fight night. Actually the biggest and highest grossing fight in boxing history. Round one. Mike Tyson prepares to fight and a spectator in the front row rises from his seat and raises his smartphone to film the historic bout. Weird fact: The year was I995. The first camera phone only became available in year 2000! Time traveler with a smartphone? Yes! It was a big fight night. 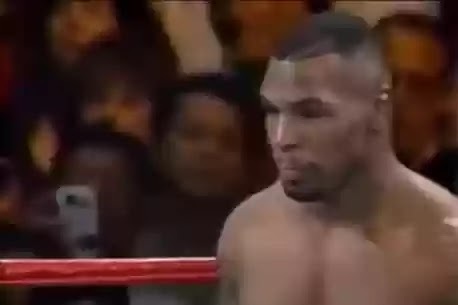 Millions of viewers around the world were glued to their seats to witness the controversial Mike Tyson fight after a four year absence from the ring. But the real question is this; Was the upcoming fight so captivating that a time traveler from the future had to travel back in time to watch the boxing match live? In the footage, the spectator rises to his feet and raises an object in his hand to film the fight. In 1995 nobody had camera phones. This is what Mail Online reported ; Jammy Bantam, said the object seems to have a lens in the centre exactly like a smartphone. He said: "I dunno if it's a time traveller or not, but no one can explain what camera it is; a QV-100 doesn't have a silver bit on the right, and this camera doesn't seem to have a black line under the lens". Scott C Waring from UFO Sightings Daily had another point of view. "What we have here is a time traveler coming back to watch their favorite fighter and sitting in the front row seats. Back in 1995 they did have phones, but they didn’t yet have cameras on them." to emerge as the video of the 'time traveler' from the future filming the action between Mike Tyson and McNeely on a smartphone goes viral.